I’m not sure if I’ve just become overly aware of the titles recently published about France, or if we’re really being invaded, but French culture has been very popular lately. I just finished two titles, Bringing up Bébé by Pamela Druckerman and French Kids Eat Everything by Karen Le Billon, and one of my colleagues blogged about Paris in Love back in April. I’ve also started rereading French Women Don’t Get Fat; I thought I might be able to appreciate the book a little more the second time around, now that I have a better understanding of French culture. Even if you don’t have children of your own, or yours are grown, these books can still be enlightening and eye opening. It was especially interesting to read the perspectives of the authors, who are American and Canadian, adjusting to their new lives in France. Search the WRL catalog for Bringing up Bébé and French Kids Eat Everything. Downton Abbey is one of the most popular British television series at our library right now. With a long waiting list on the first season and the wait building on the second, I thought I would offer a few alternatives. Here are four titles sure to please, while you are waiting…. 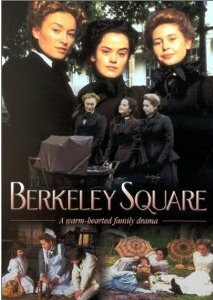 Berkeley Square: This series is set in the early 1900’s in Berkeley Square, a wealthy neighborhood in the west end of London. The story focuses on three nannies who meet in the adjacent park and become friends. The nannies come from very different backgrounds and circumstances. Their personal issues begin to encroach on their work lives, putting each woman in compromising situations. While the storylines of this series mostly revolve around the help and their relationships, the following recommendations tend to focus more on the wealthy family members. The Forsyte Saga (2002): Based on the novel by John Galsworthy, the Forsyte Saga series was originally produced in 1967. This updated adaptation is a much shorter, abridged version of the story. This saga follows several generations of the wealthy Forsyte family through many difficulties: unhappy marriages, infidelity, and disownment. Although the saga is dark at times, eventually, many of the family members find some happiness after years of strife. This series is issued in two parts. Gosford Park: This feature film is an American production, written by British screenwriter Julian Fellowes, who later created the series Downton Abbey. It’s a murder mystery is set in the English country manor, Gosford Park. Several family members and friends are invited for a shooting party; each brings their own servants for their stay at the manor. As the story unfolds, we begin to learn the secrets of many of the characters. This sets the stage for multiple suspects, from upstairs and down. The film will keep you guessing right to the end, but eventually, the murderer and motive are revealed for a surprising conclusion. The Grand: This series begins on New Year’s Eve, 1919. The Grand hotel has recently reopened after expensive renovations, which sets the stage for financial trouble from the outset. This is quickly resolved through a partnership between the Bannerman brothers, who have very different ideas and intentions. While the Bannermans have their own issues to contend with, the guests’ and staff’s lives also bring intrigue and drama to the hotel. This series is issued in two parts. Search the WRL catalog for Berkeley Square, The Forsyte Saga, The Forsyte Saga: Series 2, Gosford Park, The Grand, and The Grand: Series 2. You may be familiar with Gladwell’s previous books, The Tipping Point, Blink, and Outliers; all on the best sellers lists. What the Dog Saw is a collection of his articles from The New Yorker magazine over the past decade. The articles are not overly long, generally 20 pages or so, which is nice if you’re looking for quick reading. Gladwell has arranged the articles in categories, but they do not need to be read in any order; each one stands on its own merit. What I enjoy about Gladwell is that he can take a subject, perhaps something that you have never really thought about, like ketchup or hair color, and draw you in. He reveals the history and background of a subject to give you a glimpse of the story behind it. His tone is conversational; you feel as though you’re reading a fictional story, but these articles are actually well-researched works of non-fiction. Some of the articles may have been more apropos when they were first published, but most of them are timeless works that will appeal to anyone. I read the ebook version of this title, which you can download here. We also have the print version, which you can find in our catalog. I found this book on the library’s mending shelves with a broken spine. As I flipped through, I began reading the thoughts, dreams, heartbreaks, sadness, and desires of strangers who felt compelled to share their secrets with the world. If you aren’t familiar with PostSecret books, they are the brainchild of Frank Warren. In November 2004, as a community art project, Warren printed 3,000 postcards and distributed them in subway stations, art galleries, and in library books. The postcards asked people to create cards of their own, sharing a secret that they had never revealed before to anyone. From millions of contributions, Warren has compiled five books and hosted art exhibits and campus events. I encourage you to check out one of Warren’s books. I was especially affected by this one, but I am sure the other titles also hold a treasure trove of emotional candor. Check the WRL catalog for A Lifetime of Secrets. Just a regular guy, raised in the American Midwest, Kelsey Timmerman journeys through four countries to discover where his favorite pieces of clothing were manufactured. His first venture is into Honduras to find the factory where his t-shirt was made. Unfortunately, the trip is fruitless. Without any contacts, he is obviously denied access to the factory, but he briefly speaks with one of the workers after hours. Although deemed a failure, this trip plants a seed to pursue further travels into Bangladesh, Cambodia, China and, finally, an American factory. Timmerman is more successful during these other trips. In Bangladesh, he goes undercover as a buyer to gain access to a factory. Although it’s not the exact one that manufactured his boxers, he is able to observe the workers and the conditions in which they work. Cambodia is the home where his Levi’s jeans have been sewn. He finds that with regulation, Cambodian factories are well run and there are few instances of child labor. In China, he is unable to tour a factory, but he speaks with a couple who make flip-flops similar to his own. On the surface, it seems Chinese workers may have better conditions, with the highest pay of the countries he visits. But Timmerman soon finds that garment workers are often forced to work many hours of overtime without pay, and many of the regulations in place to protect them are not enforced. Although Timmerman touches on the economics of the garment industry, his main focus is on the people and their difficult lives. A common thread among each of these workers is family. Many of them leave small villages to work in the city and send money home to support their parents, siblings, and often their own children. With little opportunity back home, the small wages of manufacturing jobs bring some stability and hope for survival. Thought provoking and revealing, Where Am I Wearing? is a human interest story that gives us a glimpse of not only how our clothing is made, but also who makes it. Check the WRL catalog for Where Am I Wearing? This debut is set in upstate New York. The main character, Dave Gurney, is a former homicide detective with the NYPD. He and his wife have moved to a remote property in a small town. Although Gurney has been retired for a year, it has been challenging to disengage from his former life. To make the process even more difficult, he has just been contacted by former college friend, Mark Mellery, whom he hasn’t seen or spoken to for twenty-five years. Mark needs help with an unusual case, which must be handled with discretion and cannot involve the police. Eventually the police do become involved when Mark is murdered. Gurney becomes entangled in the investigation and is hired as a consultant to solve not only this homicide, but several others that are found to be connected. Think of a Number is a compelling mystery; I really had a hard time putting it down. Surprisingly, it is written by a former advertising executive. I expected John Verdon was a former investigator or at least had some background in criminal justice. His characters are very believable and the clues are quite puzzling. For instance, how does the killer know what number his victim is thinking of, before he even thinks it? Evidence at the crime scenes is also confusing and keeps not only the characters guessing, but the reader guessing as well. Verdon reveals very little additional information to the reader, which makes the story that much more intriguing. I didn’t suspect who was behind the crimes until nearly the end of the book. Check the WRL catalog for Think of a Number. Alfred Hitchcock is one of my favorite directors. He is known for psychological thrillers and as a master of suspense classics such as Psycho, Rear Window, and The Birds. The Trouble with Harry is a lesser-known work and one of Hitchcock’s few comedies. The film starred Edmund Gwenn and John Forsythe (early in his career). It was also the debut for two other well known actors—Shirley MacLaine and a very young Jerry Mathers (who later played Beaver in Leave it to Beaver). The opening scenes of the film show a quaint, picturesque New England town during early autumn. A small boy traipses through the woods and up a hill as three gun shots are heard in the distance. He continues to a clearing where he sees a man lying on the ground with blood on his forehead. The boy runs away, presumably to find help. Next we see an older gentleman, Captain Wiles, who fired the three shots while rabbit hunting. Captain Wiles finds a tin can and a sign that he hit with the first two shots, but no rabbit. As he climbs a small hill he sees a body lying in the clearing. Wiles believes he has found where the third bullet ended. As Wiles tries to hide the body, several people happen to come by in this remote, woodsy area. The little boy returns with his mother, who recognizes the man and seems content to see him gone. A hobo wanders through and takes the dead man’s shoes. A local man, distracted by the book he is reading, trips over the body without notice. An older woman, who knows Captain Wiles, sees him moving the body, but promises not to divulge his secret. Eventually, Harry, the dead man, is buried. But a turn of events, a sort of comedy of errors, causes Harry to be dug up and buried, and then dug up and buried again, and finally exhumed for a third time. I won’t reveal any more, but there are several very complicated reasons why Harry’s body just can’t stay underground. The Trouble with Harry is definitely not Hitchcock’s usual fare, but you can still feel his directorial presence. The dialogue, although somewhat stilted, subtly reveals each character’s quirks. The pacing and mood of the scenes are very deliberate. Although the film isn’t laugh-out -loud funny, there is a very wry, dark humor just beneath the surface. If you have never watched a Hitchcock film, I wouldn’t recommend this as the place to start, but for those who appreciate his work, you will find The Trouble with Harry a welcome diversion.